The Guiana Shield is one of the three cratons of the South American Plate. It is a 1.7 billion-year-old Precambrian geological formation in northeast South America that forms a portion of the northern coast. The higher elevations on the shield are called the Guiana Highlands, which is where the table-like mountains called tepuis are found. The Guiana Highlands are also the source of some of the world's most spectacular waterfalls such as Angel Falls, Kaieteur Falls and Kuquenan Falls. 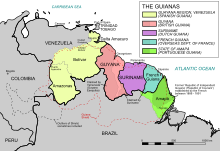 The Guiana Shield underlies Guyana (previously British Guiana), Suriname (previously Dutch Guiana) and French Guiana (or Guyane), much of southern Venezuela, as well as parts of Colombia, and Brazil. The rocks of the Guiana Shield consist of metasediments and metavolcanics (greenstones) overlain by sub-horizontal layers of sandstones, quartzites, shales and conglomerates intruded by sills of younger mafic intrusives such as gabbros. The oldest rocks in the shield consist of Archean Imataca Complex, composed of a quartz-feldspar gneiss and subordinate mafic gneiss. The Guri Fault marks the southern boundary of the complex. South of that fault are Early Proterozoic rocks consisting of the metavolcanic Pastora Supergroup and the granitic plutonic Supamo Complex. The Cuchivero Group consists of ash flow tuff and granitic plutonic rocks. The Early to Middle Proterozoic Roraima Group consists of continental clastic sedimentary rocks. These Precambrian sediments include quartz sandstones, quartzites, and conglomerates presumed to be 1.8 to 1.4 Ga in age. The north-central part of the Guiana Highlands is dominated by high flat-topped peaks called tepuis, of the Roraima supergroup and Quasi-Roraima formation, and the rounded granite peaks of the Parguaza and Imataca complexes to the north and southwestern edges of the area. The highest point in the shield is Pico da Neblina in Brazil at 2,995 metres (9,826 ft). Pico da Neblina is the highest summit of the larger Neblina massif, a highly eroded sandstone plateau that straddles the Venezuela-Brazil border and that has lost the typical tabletop shape of the other tepuis in the region. The Guiana Shield is one of the regions of highest biodiversity in the world, and has many endemic species. The region houses has over 3000 vertebrate species: 1168 fresh water fish, 269 amphibians (54% endemics), 295 reptiles (29%), 1004 birds (7.7%), and 282 mammals (11%). Diversity of invertebrates remains largely undocumented, but there are several species of endemic butterflies and dung beetles. Plant life is equally rich and 13,367 species of vascular plants have been found, approximately 40% of which is considered endemic. The shield is overlain by the largest expanse of tropical forest on any Precambrian shield area in the world. Guianan rain forest is similar in nature to Amazonian rain forest and known protected areas include the Iwokrama Forest of central Guyana, Kaieteur, Kanuku National Park of southern Guyana, the UNESCO World Heritage Site Central Suriname Nature Reserve of Suriname, the Guiana Amazonian Park in French Guiana and the Tumucumaque National Park in the Amapá State of Brazil. In Venezuela the forests are protected by Canaima, Parima-Tapirapeco and Serranía de la Neblina national parks. In 2014, the Government of Colombia designated a 250 hectare area of the Guaina Shield, as a Ramsar Wetland, thus becoming a protected area of international importance in accordance to the Ramsar Convention. According to recent researches, ecosystems of the Guayana Highlands are in danger because of non-native plant species (including "a well-known invasive plant elsewhere" Poa annua and "one of the most aggressive weeds" Polypogon elongatus) and infectious faecal bacteria Helicobacter pylori introduced by tourists. 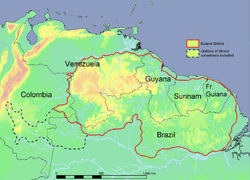 ^ The term Guiana or The Guianas is often used as a collective name for Guyana, Suriname and French Guiana, and sometimes even includes the portions of Colombia, Venezuela and Brazil which are on the Guiana Shield. ^ Geology and Mineral Resource Assessment of the Venezuelan Guayana Shield, USGS Bulletin 2062. US Government Printing Office. 1993. pp. 10–15. ^ Wray, Robert (2010). Migon, Piotr (ed.). The Gran Sabana: The World's Finest Quartzite Karst?, in Geomorphological Landscapes of the World. Springer. pp. 80–81. ISBN 9789048130542. ^ "Geociências: IBGE revê as altitudes de sete pontos culminantes" [Geosciences: IBGE revises the altitude of seven high points] (Press release) (in Portuguese). Brasília: Brazilian Institute of Geography and Statistics (IBGE). 2016-02-29. Retrieved 2016-03-02. ^ Hollowell, T.; Reynolds, R.P. (2005). "Checklist of the Terrestrial Vertebrates of the Guiana Shield" (PDF). Bulletin of the Biological Society of Washington. 13. ^ Vari, R.P. ; Ferraris Jr., C.J. ; Radosavljevic, A.; Funk, V.A. (2009). "Checklist of the freshwater fishes of the Guiana Shield" (PDF). Bulletin of the Biological Society of Washington. 17. ^ Ferrer-Paris, José R; Lozano, Cecilia; Cardozo-Urdaneta, Arlene; Thomas Cabianca, Arianna (2016). "Indicative response of Oxysternon festivum Linné (Coleoptera: Scarabaidae) to vegetation condition in the basin of the Orinoco river, Venezuela". Journal of Insect Conservation. in press (3): 527–538. doi:10.1007/s10841-016-9886-6. ^ Costa, Mauro; Viloria, Ángel L.; Hubber, Otto; Attal, Stéphane; Orellana, Andrés (2013). "Lepidoptera del Pantepui. Parte I: Endemismo y caracterización biogeográfica". Entomotropica. 28 (3): 193–217. Retrieved 25 June 2016. ^ Funk, V.; Hollowell, T.; Berry, P.; Kelloff, C.; Alexander, S.N. (2007). 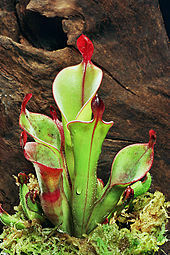 "Checklist of the Plants of the Guiana Shield (Venezuela: Amazonas, Bolivar, Delta Amacuro; Guyana, Surinam, French Guiana)" (PDF). Contributions from the United States National Herbarium. 55. ^ Rull, V.; Vegas-Vilarrúbia, T.; Safont, E. (2016). "The Lost World's pristinity at risk". Diversity and Distributions. 22 (10): 995–999. doi:10.1111/ddi.12469.